SeaWorld San Diego officials Thursday mourned the death of a pygmy sperm whale calf rescued by employees after it was stranded on La Jolla Shores Beach on July 28. 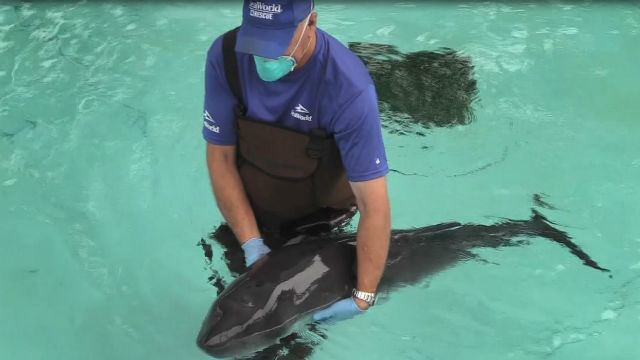 The calf had been in “critical and guarded condition” since it came to the park, and died around 11 p.m. Wednesday despite having shown signs of improvement, according to SeaWorld. “We’re just heartbroken about the loss of this little calf,” said Jody Westberg, head of the park’s stranded animal program. A post-mortem exam, or necropsy, will be performed to try to determine the cause of death. SeaWorld has also been in contact with National Marine Fisheries Service about the status of the whale.